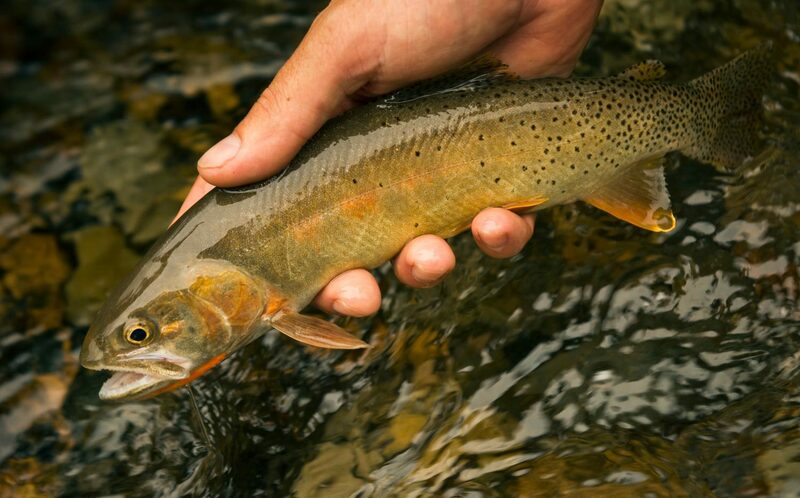 Are you fixing to head out west for an exciting trout fishing trip? If yes, and you plan to do some wade fishing, pay close attention to water levels before you decide on where to start your days fishing. Recently, Louis and I visited the Greys River in Wyoming for the opportunity to enjoy catching beautiful Snake River cutthroats on dries. Water levels were very high on the Greys, and the lower sections of the river were too high to wade safely or fish effectively. We found out very quickly, if we were going to get into some good fishing, we’d have to focus our efforts on fly fishing the upper sections of the watershed. That meant targeting the water above most of the tributaries dumping into the Greys, and driving 25 miles further up the forest service access road. The extra time driving cut into our time fishing, but the strategy paid off, as we immediately began catching fish right out the gates. We also found out that the majority of the trout on the Greys River were taking residence in the upper stretches, for the simple fact that the lower flows found there allowed the trout to feed more easily and burn less calories (less current to fight). Louis and I found that most of the fish on the upper section of the Greys River were holding in areas where the water current was moving quite a bit slower than the main river. Notice the soft water located off the green bush in the picture below the laydown. This tiny bath tub area of water accounted for six cutthroat trout landed on a size 12 stimulator. Sometimes it’s the tiny, not so obvious spots in trout streams that many of us overlook that we should pay more attention to and fish. They often can end up being the most productive places to catch fish during the day. 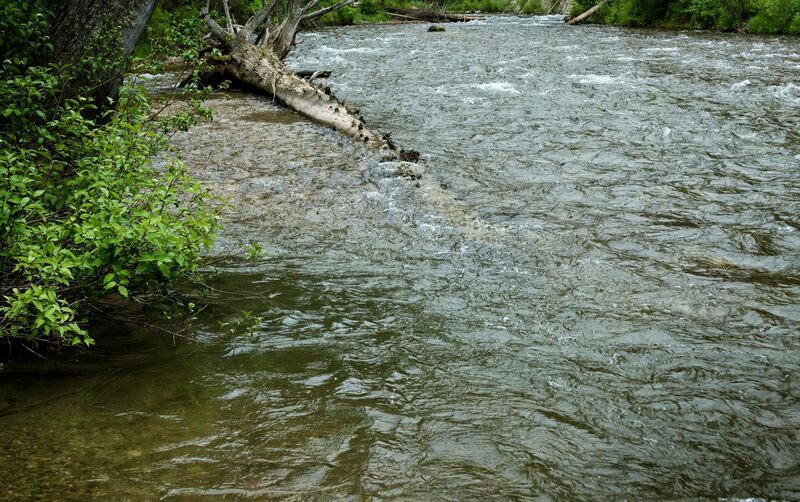 Look for spots like this, next time you’re trout fishing on a stream that has high flows. Areas close to the bank are the first places I look because the irregular bank line provides nice current breaks for the trout to feed and conserve energy. This entry was posted in Fishing Stories, Trout Fishing and tagged Fly Fishing, fly fishing blog, fly fishing for cutthroats, fly fishing outwest, fly fishing tips, Gink & Gasoline, Gink and Gasoline, Kent Klewein, Louis Cahill, Six Cutties in a Hot Tub, trout fishing by Louis Cahill. Bookmark the permalink. Note that this soft water “bucket” was created by the downed tree, aka large woody debris. The tree’s root wad anchors it in place which allows the trunk to trap and store bedload sediment which created the gravel bar. Water flowing over this deposition scoured out the bucket. You very well described the important role that these micro-habitat features play during periods of high water. Eventually a high spring runoff will transport this tree further downstream and this bucket will fill in with sediment. But the tree will most likely contribute to fish habitat in another way. Thanks and keep up the great job of stoking our passion for flyfishing!